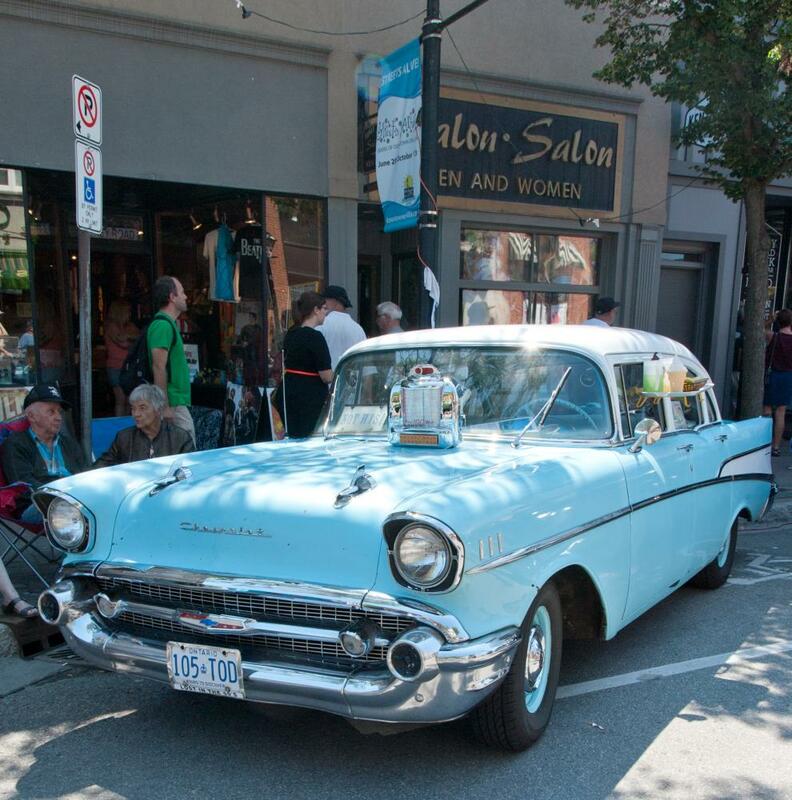 Coming up this weekend (Saturday, August 19th) in downtown Orillia is the annual classic and vintage car show - a treat for everyone. 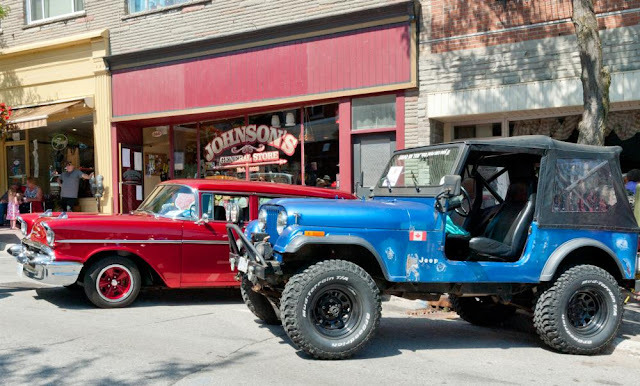 (Facebook Event Page is here) If you haven't been there and like vehicles, you'll want to have a wander around the downtown area. And if you have been there, you know this isn't a summer event that you'll want to miss. I love being able to get down to this show ... we've missed a few in the past, but we've been to most of them. The downtown atmosphere is nearly always festive ... a little bit like a street fair. 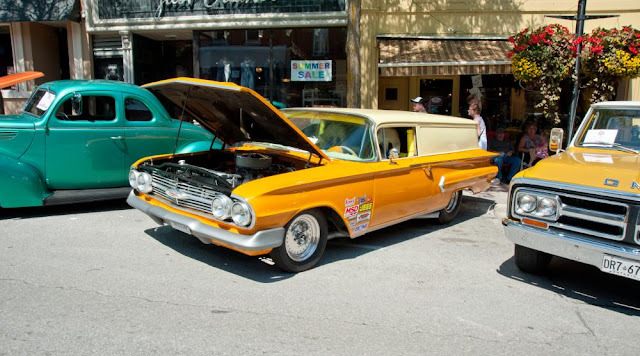 Main streets are blocked off and all the parking spaces on the street are occupied by old cars and trucks - classic, antique, hot rods, and trucks. People wander around the streets in all manner of dress, and you'll find the owners of these great classics are a friendly bunch of people. You can look to your heart's content and ask tons of questions, just don't lean on their cars or touch them, or kick the tires. Over the years the show has grown from taking up part of Mississaga Street, to filling it to overflowing, and eventually causing a few of the side streets (Peter St. most of the time) to be blocked off to handle the growth. 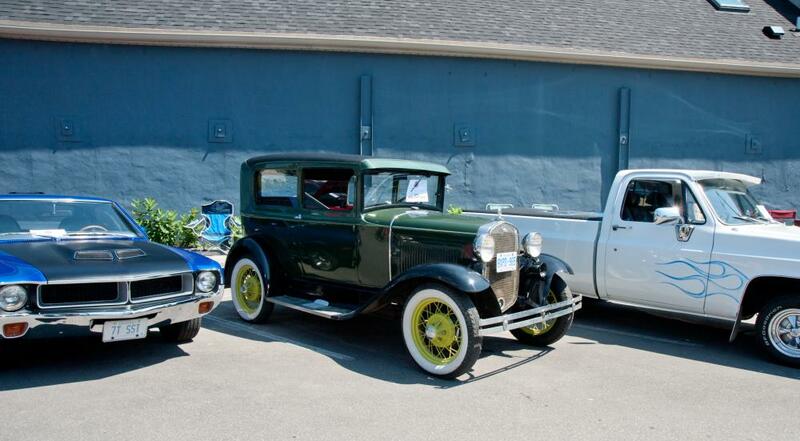 Not only does the show have vintage & classic models, but some more contemporary vehicles customized to the point of making them a definite show piece you'll want to see. 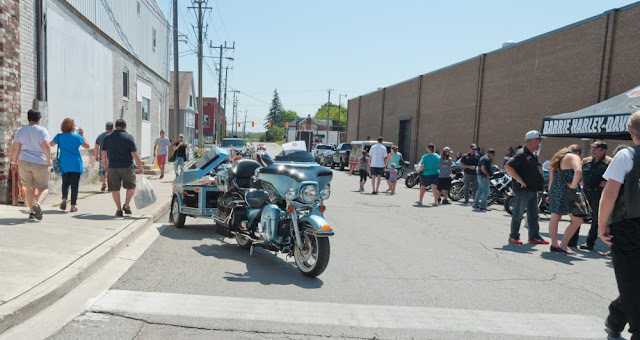 The show often includes motorcycles as well, and sometimes even an old peddle car or two. Hard to beat this finned wagon. It's just a really fun time for people who love cars, and for kids too. We used to take our grandkids down where they were babies & toddlers, and now, well they're old enough to go on their own. The show doesn't necessarily include a lot of street vendors (though there are sometimes a few), but the shops are open and many have specials for the day and there's often some street musicians, sometimes things for the kids to do ... just a great free way to spend a Saturday in the summer. With the cost of many events throughout the summer, it's really nice to enjoy some events that don't have to cost you anything, and because Orillia's downtown is so close to the waterfront, a great way to finish the day is with a picnic in the park (that of course depends on the weather), and dip in Couchiching ... or a trip on the Island Princess. Whatever you decide to do in Orillia this weekend, I hope you have a blast! Harley Davidson bikes draw the crowds anywhere.